Let's say your 20-foot Prowler travel trailer has reached the end of its useful life on the road and you're unsure what to do with it. You also happen to be in dire need of more commodious accommodations from which to hunt the fauna of your choice. 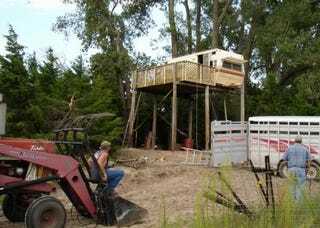 You're in luck friend, as we've discovered the perfect way to solve both problems at once — the elevated trailer deer stand. Like the Gods upon the mountaintop...er, telephone pole, this bedecked trailer looks down upon its surroundings as its creator rains down upon the herd an unstoppable fury of lead and marksmanship.